Gracie and her support group of family and community members pose for a group photo. Photo courtesy of S.Miller. 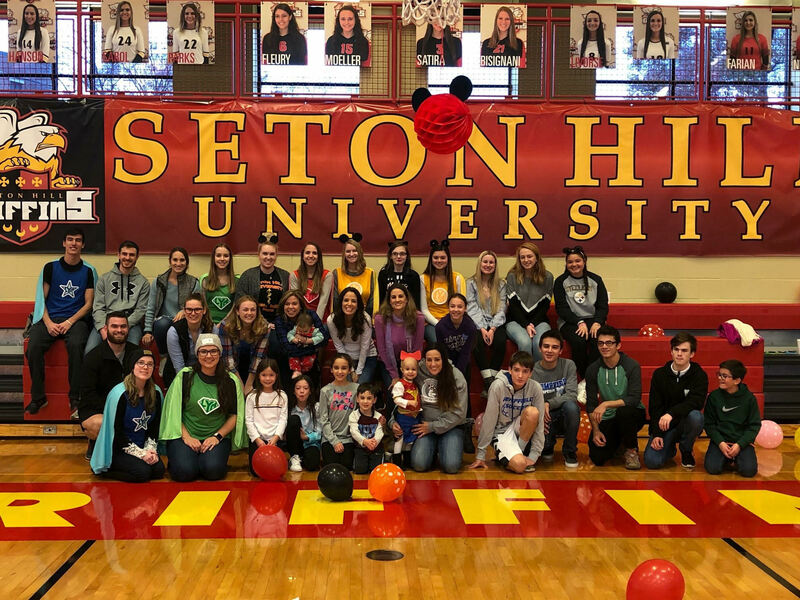 The Physician Assistant Society and Love Your Melon Club hosted Gracie Gorman and her family, from Irwin, Pa. as well as community members in McKenna Gym Nov. 18 for a carnival. The theme was Mickey Mouse because of the 2-year-old’s love for the character. “You could say we’re similar to Make-a-Wish, but tied to LYM we give all the children and their families LYM hats in addition to the event. We get no outside funding from LYM for the events, and rely on prior SHU fundraisers,” said former Love Your Melon club president Nicole Berardinelli. Gracie was diagnosed with Acute Lymphocytic Leukemia, a type of blood and bone marrow cancer which affects white blood cells, on Feb. 1. This was just 10 days after her grandmother passed from cancer. Gracie is pictured above chatting with former Love Your Melon Club president Nicole Berardinelli. Photo courtesy of S.Miller. Gracie loves her sisters and to “nuggle” (snuggle). Her other interests include swimming, anything to do with Trolls and Disney. Gracie loves coming home from anywhere or after a long day at the hospital. “Fun fact: Gracie and her younger sister Vienna were born with the same weight and height,” Gorman said. When there is an event, the Love Your Melon Club members get the families involved with planning by asking about the child’s interests. Since 2015, there have been events for kids on and off campus. The first event involved three pumpkins to decorate at the child’s home and last year, an Easter egg scavenger hunt was held on campus for another little girl. Various carnival games available to the attendees included Pluto’s bean bag basket toss, Mickey Mouse ear hopscotch, pin the bow on the Minnie and differing crafts. Darren Achtzehn, director of food services at SHU, provided cookies to decorate, mini Hot Diggity Dogs and more. 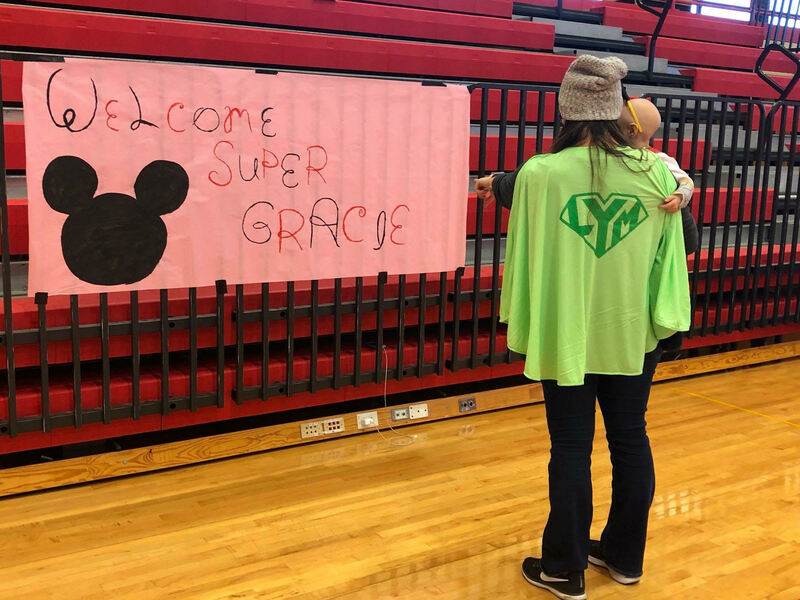 There was a photobooth, popcorn and an abundance of Minnie-themed decorations for Gracie, her family and friends to enjoy. Decorations included Mickey Mouse balloons, streamers, Mickey Mouse Clubhouse music and happy smiles from the Love Your Melon club members. 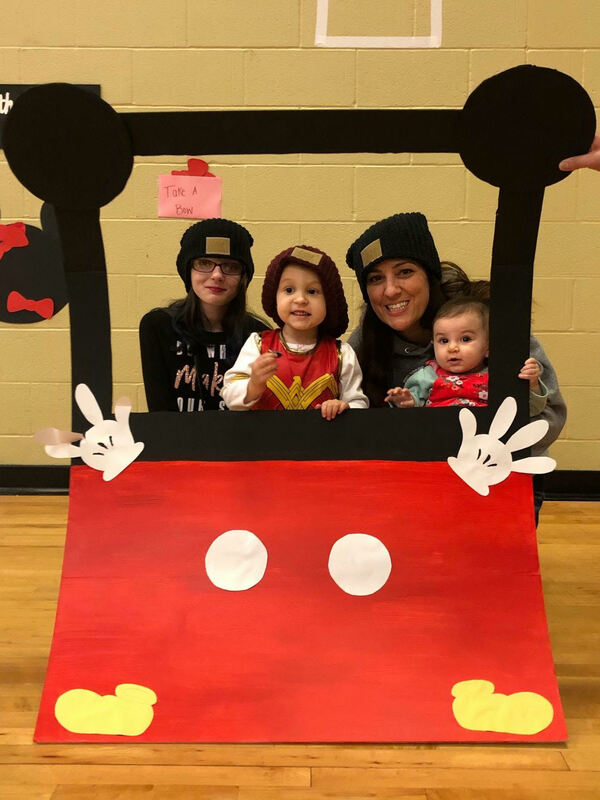 Gracie and family are pictured above getting photographed with the Mickey Mouse photo booth. Photo courtesy of S.Miller. The volunteers at the event were able to interact with Gracie and the family, making sure they had everything they wanted. Gracie was a fan of the Hot Diggity Dogs and cookie table available to them. Gracie said she loved her “MiMi” party. At the event, she wore a Wonder Woman costume to show her strength against her cancer. “I think it’s important to help her remember there is a light at the end of the tunnel and a day to be a kid… not just a cancer kid,” Gorman said. Gorman added a thanks to everyone who took time and energy into creating a day to make her daughter feel special. She said it truly meant so much to her and her family, as it does any other. Beall said the superhero events are important because they allow kids battling cancer to just be kids. “I just really love seeing the kids’ faces when they walk through the door, it really is something that changes you,” Berardinelli said.